A few years before Pee-Wee's Playhouse hit the airwaves and made Pee-Wee Herman a Saturday morning star, he made a couple Halloween appearances on Late Night with David Letterman that almost started a tradition. Dressed as a pirate in 1983 and as the devil in 1984, Pee-Wee would entertain Dave with several toys, camera tricks, and green screen fun. The mini variety show actually began a year earlier with Pee-Wee's first appearance on Late Night. He would entertain with toys, singing, the Pee-Wee dance, and messing with students in a cafeteria video. He would later attribute the success of his stage show, which sold out Carnegie Hall in 1984, to being a guest on Letterman. Two of those appearances were on Halloween and almost started a tradition. Pee-Wee's antics on Halloween in 1983 included some Halloween toys including a vampire that left a mark on Dave and a spooky haunted house. Pee-Wee also gets Dave to try on some funny glasses and also switch mouths with the host thanks to a camera trick. Later, Pee-Wee and Dave visit a spooky laboratory. 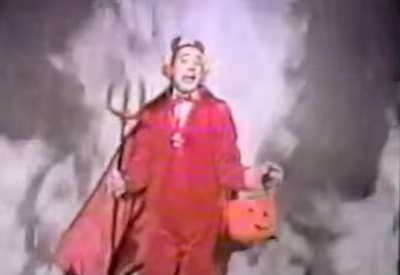 A year later in 1984, Pee-Wee appeared again on Halloween dressed as a devil and pretending to stab people with his pitchfork in front of a green screen. He later goes on to show Dave a Barbie magazine and his Gremlins collection. His final comment is a Halloween safety tip reminding everyone "not to eat any apples you can shave with." Pee-Wee would make a couple more appearances on Late Night before landing his Saturday Morning show but unfortuenately the Halloween tradition didn't last. Watching these videos now makes me wish it did last a few more years, but I guess once you hit the big time you don't need to do sideshow gags on talk shows anymore.